GSM is a connection between two people − a caller and the called person – is the basic service of all telephone networks. To apply this service, the network must has ability to set up and maintain a call, which includes some tasks: identifying the called person, determining the location, routing the call, and ensuring that the connection is continued until conversation lasts. After the transaction, the connection is terminated. In a fixed telephone network, providing and managing connections is an easy process, because telephones are connected by wires to the network and their location is permanent from the networks’ point of view. Whereas, in a mobile network, the establishment of a call is more complex task, because it doesn’t have wire and permanent location. It enables the users to move by wireless (radio) connection. GSM stands for Global System for Mobile Communication and is an open, digital cellular technology transmits mobile voice and data services. It is a digital mobile telephony system that is widely used technology in the world. The GSM market has more than 70 percent of the world’s digital cellular subscribers. The GSM makes use of narrowband Time Division Multiple Access (TDMA) technique for transmitting signals. The GSM was developed by using digital technology. It has an ability to carry 64 kbps to 120 Mbps of data rates. GSM operates at either the 900 MHz or 1800 MHz frequency band. In Europe, operates in the 900MHz and 1.8GHz bands and in US, operates 1.9GHz and 850MHz bands. The GSM is a circuit-switched system that divides each 200 kHz channel into eight 25 kHz time-slots. Cell phones use GSM network by searching for cell phone towers in the nearby area. GSM carriers have roaming contacts with other GSM carriers and typically cover rural areas more completely. GSM also has the advantage of using SIM (SubscriberIdentityModule) cards. The SIM card, which acts as your digital identity, is tied to your cell phone service carrier’s network rather than to the handset itself. This allows for easy exchange from one phone to another without new cell phone service activation. The OSS stands for operation and support system. The function of OSS is that monitors and controls the system. The aim of OSS is that customer cost-effective support for centralized, regional, and local operational and maintenance activities that are needed for a GSM network. An important task of OSS is to ensure a network overview and support the maintenance activities of different operation and maintenance organizations. The switching system (SS) is responsible for performing call processing and Subscriber-related functions. Home location register (HLR)—The HLR is a database used for storage and management of subscriptions. The HLR stores permanent data about subscribers, including a subscriber’s service profile, location information, and activity status. When a person buys a subscription, he/she is registered in the HLR of that operator. Mobile services switching center (MSC)—The MSC performs the telephony switching functions of the system. It controls calls to and from other telephone and data systems. Also, it performs toll ticketing, network interfacing, common channel signaling, and others functions. Visitor location register (VLR)—The VLR is a database that contains temporary information about subscribers that is needed by the MSC in order to service visiting subscribers. The VLR is always integrated with the MSC. When a mobile station roams into a new MSC area, the VLR connected to that MSC will request data about the mobile station from the HLR. Later, if the mobile station makes a call, the VLR will have the information needed for call setup without having to interrogate the HLR each time. Authentication center (AUC)—A unit called the AUC provides authentication and encryption parameters that verify the user’s identity and ensure the confidentiality of each call. The AUC protects network operators from different types of fraud found in today’s cellular world. Equipment identity register (EIR)—The EIR is a database that includes information about the identity of mobile equipment that intercepts calls from stolen, unauthorized, or defective mobile stations. All radio-related functions are performed in the BSS, which consists of base station controllers (BSCs) and the base transceiver stations (BTSs). BSC—The BSC provides all the control functions and physical links between the MSC and BTS. It is a high-capacity switch that provides functions such as handover, cell configuration data, and control of radio frequency (RF) power levels in base transceiver stations. BTS—The BTS handles the radio interface to the mobile station. The BTS is the radio equipment (transceivers and antennas) needed to Service each cell in the network. BSC controls a group of BTSs. MS stands for Mobile Station. It is a combination of terminal equipment and subscriber data. The terminal equipment is called ME (Mobile Equipment) and the subscriber’s data is stored in a separate module called SIM (Subscriber Identity Module). Therefore, ME + SIM = MS. The SIM card contains an identification number of the user and list of available networks. Roaming allows a mobile subscriber to automatically make and receive voice calls, send and receive data, or access other services when travelling outside the geographical coverage area of their home network, by means of using a visited network. Roaming is technically supported by mobility management, authentication and billing procedures. Establishing roaming between network operators is based on – and the commercial terms are contained in – dedicated roaming agreements. If the visited network is in the same country as the home network, this is known as national roaming. If the visited network is outside the home country, this is known as international roaming. GSM Roaming, which involves roaming between GSM networks, offers the mobile subscriber the convenience of being able to use a single number, a single bill and a single phone. The convenience of GSM Roaming has been a key driver behind the global success of the GSM Platform. The GSMA’s GSM Coverage Maps are a unique resource containing information supplied and approved by the members of the Association. The network, services and roaming information are continually updated to reflect the evolving situation worldwide. Interactive coverage maps, updated quarterly, allow you to navigate to see where exactly you can use your phone. GRANis an abbreviation of GSMRadio Access Network. It consists of Base Transceiver Stations (BTS) and Base Station Controllers (BSC). Its purpose is to manage the radio link between mobile phones and a telecommunicationcore network. This access network provides access to both Circuit switched (CS) and Packet switched (PS) core networks. Aradio access network(RAN) is part of a mobile telecommunication system. It implements a radio access technology. Conceptually, it resides between devices like a mobile phone, a computer, or any remotely controlled machine and provides connection with its core network (CN). Depending on the standard, mobile phones and other wireless connected devices are varyingly known as user equipment (UE), terminal equipment, mobile station (MS), etc. RAN functionality is typically provided by a silicon chip residing in both the core network as well as the user equipment. 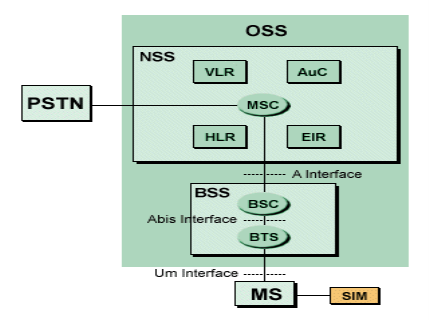 GSM network in addition to the Network Switching Subsystem (NSS) and Base Station Subsystem (BSS). The purpose of the NMS is to monitor various functions and elements of the network. The operator workstations are connected to the database and communication servers via a Local Area Network (LAN). The database server stores the management information about the network. The communications server takes care of the data communications between the NMS and the equipment in the GSM network known as “network elements”. These communications are carried over a Data Communications Network (DCN), which connects to the NMS via a router. These functions cover the whole of the GSM network elements from the level of individual BTSs, up to MSCs and HLRs. The aim of fault management to detect different type of problems then solve them rapidly. Fault management provides the network operator with information about the current status of alarm events and maintains a history database of alarms. The alarms are stored in the NMS database and this database can be searched according to criteria specified by the network operator. The purpose of configuration management is to maintain up-to-date information about the operation and configuration status of network elements. Specific configuration functions include the management of the radio network, software and hardware management of the network elements, time synchronization, and security operations. In performance management, the NMS collects measurement data from individual network elements and stores it in a database. On the basis of these data, the network operator is able to compare the actual performance of the network with the planned performance and detect both good and bad performance areas within the network. A typical GSM base station, can’t do anything without a suite of components that maintain databases, perform call-­switching functions, and so forth. This infrastructure is expensive (typically around $250,000) and complicated to configure, and it needs to be stored in an air-conditioned room. Obviously, that’s impractical in the kinds of places ­OpenBTS is designed for. As a result, the system replaces much of the physical infrastructure of the core network with VoIP software–in this case, an open-source program called Asterisk that can be installed on any off-the-shelf PC. Cell-phone users on an OpenBTS network can reach each other even if the system isn’t connected to the Internet, but reaching someone outside the network requires an Internet connection. On Niue, the group used five-gigahertz IP radios to link the BTS unit to Telecom Niue’s wired Internet infrastructure, four kilometers away. Burgess says that response time can get a bit sluggish if the Internet connection isn’t very good, but it doesn’t take much bandwidth to make the system functional. The system deployed on Niue draws about 60 watts of power, supplied by three marine batteries of the type that many locals use on their boats. Because the system’s power requirements are so low, Burgess says, a base station could also run on solar or wind power. OpenBTS re-creates the technology behind GSM (the global system for mobile communications), which is used by the majority of mobile phones in the world. Any GSM phone will “see” an OpenBTS network as a standard cell network and interact with it normally. Like any cell network, an OpenBTS system requires an antenna to facilitate signaling. Different types of antennas can be used, according to the range the operator wants the network to have. First-generation mobile systemsused analog transmission for speech services. It offered handover and roaming capabilities, but it was unable to interoperate between countries. So, this is disadvantage of first-generation. Second generation mobile system used digital transmission. It able to use handover and roaming capabilities. It uses FDMA, TDMA, and CDMA. Third generation technology has fast data transfer rate. It enables to add services like mobile television, GPS, and video conferencing. Services include a wide area wireless voice telephony, video call, and broadband wireless data, all in mobile environment. Fourth generation technologyhas more bandwidth and services than 3G. The expectation for the 4G technology is the high quality audio/video streaming overend to end Internet Protocol, and work at 100 Mbps for mobile users and upto 1 Gbps over fixed stations. The word “MAGIC” also refers to 4G wireless technology which stands for Mobile multimedia, Any-where, Global mobility solutions over, integrated wireless and Customized services. Fifth generation technology has changed the means to use cell phones within very high bandwidth, high connectivity, and has extraordinary data capabilities. User never experienced ever before such a high value technology. The 5G technologies include alltype of advanced features which makes5G technology most powerful and in huge demand in near future. 5G technology including camera, MP3 recording, video player, largephone memory ,dialing speed, audio player and much more you never imagine. 5G technology going to be a new mobile revolution in mobile market, so may be incoming days 5G technology takes over the world market. Year by year, the GSM system improves and its subscribers increases around the world. It divides into three main parts that are OSS, SS, and BSS. These parts include some important department that manages the system, stores information of users, and another tasks. GSM has ability to roam worldwide and has roaming agreements in place with foreign operators globally. So, users can easily use their same SIM in another cities or countries. GSM network facilitate easier access to cellular and satellite platforms across international lines. Using digital technology, it employs both speech and data channels in its system. In addition, GSM has network management subsystem that detects problems and solves them, maintains information up to date, and detects good and bad performance of a network. "Global System for Mobile (GSM) Communication Overview." UKEssays.com. 11 2018. All Answers Ltd. 04 2019 <https://www.ukessays.com/essays/computer-science/global-system-mobile-gsm-communication-9802.php?vref=1>. "Global System for Mobile (GSM) Communication Overview." All Answers Ltd. ukessays.com, November 2018. Web. 18 April 2019. <https://www.ukessays.com/essays/computer-science/global-system-mobile-gsm-communication-9802.php?vref=1>. UKEssays. November 2018. Global System for Mobile (GSM) Communication Overview. [online]. Available from: https://www.ukessays.com/essays/computer-science/global-system-mobile-gsm-communication-9802.php?vref=1 [Accessed 18 April 2019]. UKEssays. Global System for Mobile (GSM) Communication Overview [Internet]. November 2018. [Accessed 18 April 2019]; Available from: https://www.ukessays.com/essays/computer-science/global-system-mobile-gsm-communication-9802.php?vref=1.